The counter on Pedal Dancer, which tallies all you wonderful visitors from 15,634 cities around the world, just sailed by 250,000 and kept right on going. It took my breathe away when I looked at the figure representing individuals from all over the world who love cycling as much as I do. Without a specific purpose I wanted to share with you what was on my task list as Pedal Dancer reached this landmark. Every week, every month, most days, I try to work on a task to build Pedal Dancer into the future. I want to be a different type of resource for cyclists, not only reporting on what the riders will do or have done in races, but a resource for information that will stick over time, making the world of being a fan that much more fun. I have spent recent days trying to learn the steps in applying for a press card, which is needed to cover the races in Europe. Not an easy task; I don't have an assignment from a magazine or news organization. I have no desire to compete with or add another news source for cycling. I am trying to build a resource for fans, a way of providing information, not only news. I have so many ideas for creating a different approach. Even when a project is sparked from enthusiastic passion, it still requires a lot of hard work. There is so much to learn! As I read more in preparation for my travels to Belgium I am awed by the tradition of both the racing and the fans in Belgium. I want to be there, to experience it fully. Set aside the time and money to make a trip like this happen, I feel a desire to know and learn as much as possible before I go, to earn the going. I also want to keep the fuel burning long after I return. I never know a place until I've walked the streets, read the signs, gotten lost 4 times, met a person with whom I have a commonality, and had an unexpected experience bad or delightful. That is travel. Yesterday I walked my dog around beautiful Balboa Island, California, as the wind rattled the rigging lines on the boats moored in the harbor. Every so often I fall back to the simple fact that the world of cycling is all about connecting people in hopes of having a faster better day on a bike. No matter who you are, we are looking for that good day, that fast ride, where all the preparation and hard work comes together. When we are better than we were before, when we have achieved. As I walked I found myself reflecting on a photo I had seen on a blog months ago, to me the image made this great big crazy world of cycling seem so much more personal. 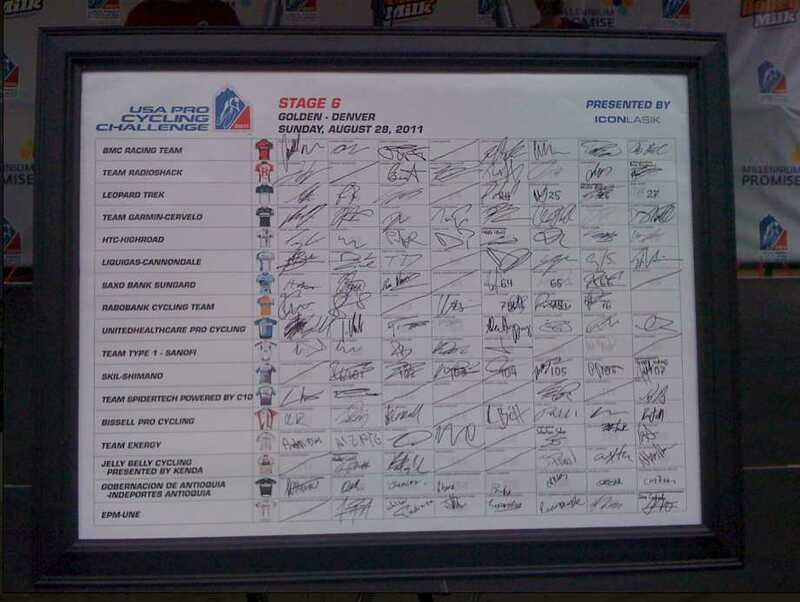 The image below is of the sign-in sheet from Stage 6 of the 2011 USA Pro Cycling Challenge. On the sheet are the signatures of every rider who mounted his bike that morning in Golden, Colorado, to give his best at competition. To me these signatures are a symbol of riders who built on their dreams day after day, never giving up hope, always believing that they could win or get a win for a teammate. Step after step until their steps took them up to the sign-in stage of a professional bike race where they stood before all to say "here I go, I am going to go get that good day, that fast ride, watch me fly." ABOUT THE IMAGE: The photo was taken at the stage start area in Golden during the USA Pro Cycling Challenge in Colorado by Brian at Dude...Buddy blog. When I contacted Brian to ask about the photo, he told me his story from the day: "All stage races have riders "sign in" for each stage. It's an official way to have the riders say they are continuing with the race. It's an unofficial way to parade the riders out before the race. My four year old and I had been up on Lookout Mountain for the race. Afterwards we rode back down to Golden. The main street where they started was all blocked off for cars and we rode through to check it out. At the start they were displaying the sign in sheet. I wish I could have seen the sign in but it was cool to see all the signatures. So I snapped a photo with my phone. Then we went to the park for the rest of the stage, we watched on a big screen they had setup. I didn't know they displayed the sign in sheet at the start, but it is pretty cool." All these years I've seen the riders sign-in at races and this was the first time I had actually seen how and what they were signing. Very cool. The sign-in sheet is a marvel of tradition in the sport of cycling. Often used to insure that riders did not skip over the route by taking shortcuts, riders were required to sign-in at various points along the stage, today they of course only sign-in at the start. In the historical book of the Tour de France titled The Tour de France, author Christopher S. Thompson writes, "The newspaper L'Auto had an obsession with assessing the beauty and elegance reflected in the racer's handwriting at the check-point sign-in sheets. A regular feature in L'Auto from the very first tour, Racers' signatures often received prominent coverage. Racers photographs were often accompanied by their autographs, suggesting that a racer's signature was as representative of him as his face." They used to have competitions and award small cash prizes to riders with the best penmanship. Glad that tradition is over, what is most notable is the dreaded line through the box of those who abandoned the race. Their dreams will continue another day. Thanks for reading! Keep on pedaling.